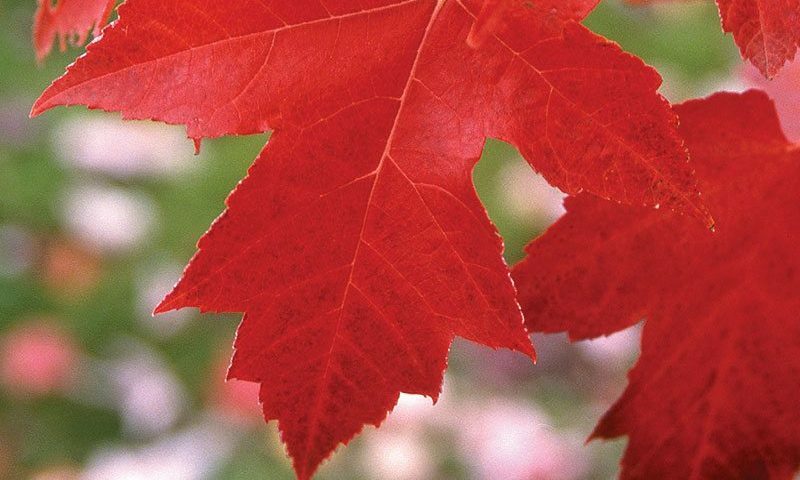 What’s A Red Maple, Anyway? I am often asked if we carry Red Maples at Johnson’s Nursery. My reply is, what do you mean by “red maple”? In this article I break down what is and isn’t a red maple, and why it matters to you. The true Red Maple (Acer rubrum), also known as Soft Maple in Wisconsin and Swamp Maple in the South, is a widespread, fast growing tree in eastern American forests. Their name comes from their early color change in autumn, with their reds, oranges, and yellows contrasting beautifully with the white birches and deep green conifers in the upper Midwest. Due to their wide range, the species has a large amount of genetic diversity and can tolerate a wide range of sites, from wet to dry and sun to shade. However, they have a hard time in alkaline soils where they tend to develop chlorosis, turning their leaves to a sickly yellow or lime green color. For this reason, we typically don’t recommend Red Maple for planting in Southeast Wisconsin where our soils have a higher pH due to their limestone parent material. The Autumn Radiance Red Maple is an exception, which retains the brilliant red fall color of its parentage while being more tolerant of alkaline soils than other cultivars. However, it still struggles with our alkaline soils, and should not be considered immune to chlorosis. Freeman maples (Acer x freemanii) are a hybrid between Red Maple (Acer rubrum) and Silver Maple (Acer saccharinum). Freeman Maples combine the gorgeous and reliable fall color of the red maple with the rapid growth and alkaline tolerance of the silver maple. They laugh in the face of compacted soils and urban pollution, are mostly indifferent to soil pH, and perform well in most sites. The Freeman Maples are also mostly sterile, meaning you won’t have thousands of samaras (AKA helicopters) to clean in the late summer each year. Because of their rapid growth rate, young trees have a tendency to stack branches and have codominant stems, requiring more pruning to keep good form. Our trees, both container and B&B, are professionally trained for good structure and won’t require babysitting when planted out to ensure good form. For a big, beautiful shade tree, the Autumn Fantasy and Autumn Blaze® cultivars are great choices. Both form a broad, dense, symmetrical canopy of green leaves with red petioles during the growing season, with the Autumn Blaze® turning an orange-red in fall and the Autumn Fantasy tending more to a ruby red. For narrow spaces, consider the Armstrong Maple, which rockets to a towering height of 60 feet with a canopy less than 20’ wide. 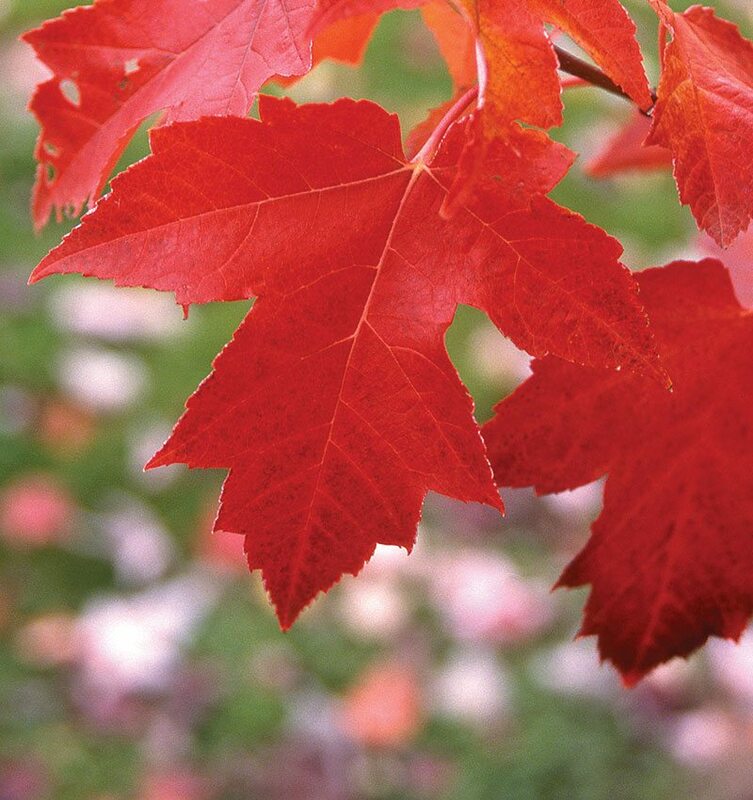 If only red sounds boring, the Celebration® Maple cultivar turns a rich gold with splashes of red and orange. And if you’re looking for a deeper fall color, the Sienna Glen® variety will deliver with a rich, burgundy red leaf in autumn. What people are typically looking for when they ask for a ‘red maple’ is one of the red-leaved Norway Maple (Acer platanoides) cultivars. These trees retain a deep maroon leaf throughout the year at the expense of no fall color. Crimson King and Royal Red are two cultivars commonly used in our region. The allure of the Crimson King and its ilk are the contrasting colors they provide in the landscape- while most other plants are green, the Crimson King or Royal Red provide a bold statement in the landscape with their heavy, deeply colored foliage. However, I believe this aesthetic interest is easily overshadowed by the many issues common in the species. For one, Norway Maples and their cultivars are prone to girdling roots that wrap around the trunk. As the trunk and roots grow larger, they choke each other and cause significant portions of dieback in the tree. The trees are also susceptible to frost cracking on the trunks, especially when planted on a southern exposure. Their wood is deceptively weak- I’ve had more than a few seemingly healthy branches snap under me while tree climbing. Let’s also not forget the profuse seed production which will readily colonize an empty bed near the tree. Possibly my largest complaint with them is that their leaves can be scorched in the hotter months, rendering their color a dull brown rather than the desired maroon-red. If you truly desire a red-leaved maple, there is an alternative in the Crimson Sunset Maple (Acer truncatum x platanoides ‘JFS-KW202’). This cultivar is a hybrid of the Norway Maple and Shantung Maple, a Chinese species. The A. truncatum parentage gives the tree a glossy leaf and superior heat resistance, making it a suitable replacement for a crimson-leaved maple. It also has a smaller mature size (35’ tall by 25’ wide) making it ideal for tight spaces where the full sized Crimson King (50’ x 50’) would be too large. If you only want color during the growing season, you may consider one of the European Beech with purple leaves, such as the Tricolor Beech or the Rivers Beech. Another option that makes for a spectacular spring show is the Royal Raindrops Crabapple, which displays an abundance of hot pink flowers in spring followed by a deep purple leaf during the rest of the growing season. As you can see, there’s more than just aesthetics that go in to the process of choosing a specimen tree for your home or business. Not every tree works in every space, and that’s why our staff is here to guide your selection with advice on mature sizes, colors, growth habits, and more. Here at Johnson’s Nursery we pride ourselves on growing quality hardy trees and plants for Wisconsin landscapes, and our staff is on hand to make sure your tree makes a statement in your landscape for a lifetime.